One pan meals are pretty much my favorite. They’re simple, efficient, and most importantly, easy to clean up! I also love that ample leftovers are often a result. Plus, the options and flavor varieties are endless. This recipe is loaded with everything you need: healthy fats, good-quality protein, healthy carbs, green veggies, and herbs/spices. Feel free to tweak the spice ratios to your taste and swap out any of the veggies based on preference or what you have on hand. Meanwhile, I’ll be making this recipe TODAY on KATU Afternoon Live. I’ll be sure to share the replay link once it’s available, but if you want to tune in live, the show is on from 3-4pm PST. To a large bowl, add the onion, chicken, sweet potato, carrot, and broccoli. In a separate small bowl, whisk together the avocado oil, coconut aminos, apple cider vinegar, garlic, oregano, smoked paprika, cumin, cayenne, sea salt, and pepper. Pour mixture over chicken and veggies and stir well to coat. Pour chicken and veggie mixture onto prepared sheet pan and spread out in an even layer. *Bake in preheated oven for 35-40 minutes or until chicken is cooked through and sweet potatoes are fork tender. 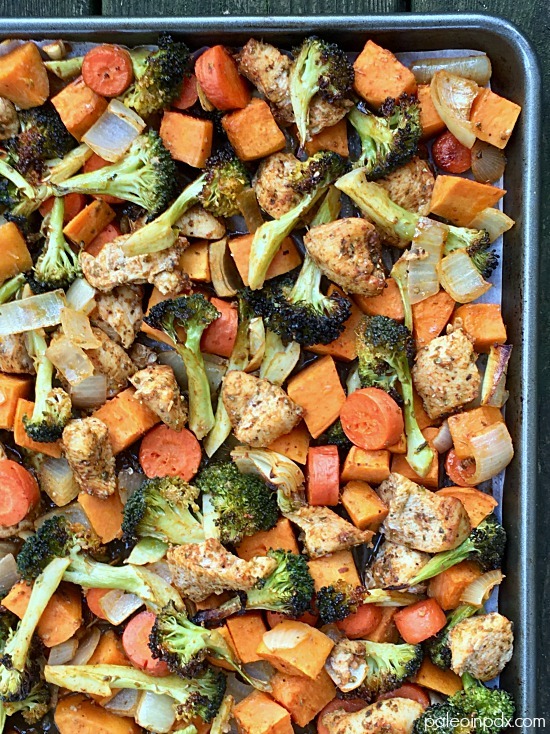 *Note if chicken is done before the vegetables (mainly the carrots and sweet potatoes), feel free to remove what’s done from the sheet pan and set aside while veggies finishing cooking. Thanks for this. It is right up my alley. I’m on Day 10 of the Whole 30 and I’m grateful for your recipes and insights. Thank you for sharing, Sandy! I appreciate your kind words and am glad the recipe is of interest to you. Cheers to you on day 10 of the Whole 30, by the way! That’s fantastic! This was delish! I used eggplant, zucchini, mushrooms, onion, garlic cloves, and sweet potatoes! 😆 Love the dressing!